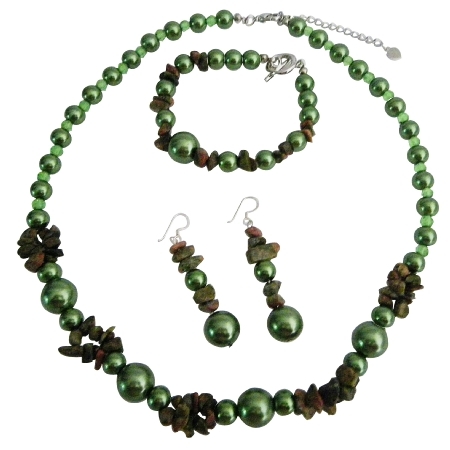 This Magnificent Necklace features Assorted Olivine Beads Olivine Nugget chips Pearls Assorted beads Pearls & different shape & sizes beads INNOVATION at the APEX to see it Accented in 17 inches Necklace with matching earrings. A cluster of iridescent multifaceted beads look pretty with many of dresses. Celebrate your individuality. The GALORE Variations in the color & pattern of each beads add that SPLENDOR!! to the Necklace Set. ABSOLUTELY GORGEOUS!! High Quality Necklace & Earring Set.EXOTIC & UNRESISTANT Wardrobe package for all time wear for all outfits.GRAND WEDDING JEWELRY Gift too.A party on the NECK & Ear lobes for where ever you go. LUSH.and BOUNTIFUL.